Lower right: "Jan. Van. / Húÿsúm. fecit. 1722"
The Dutch fascination with nature is described in a riotous display of beautiful and exotic flowers. 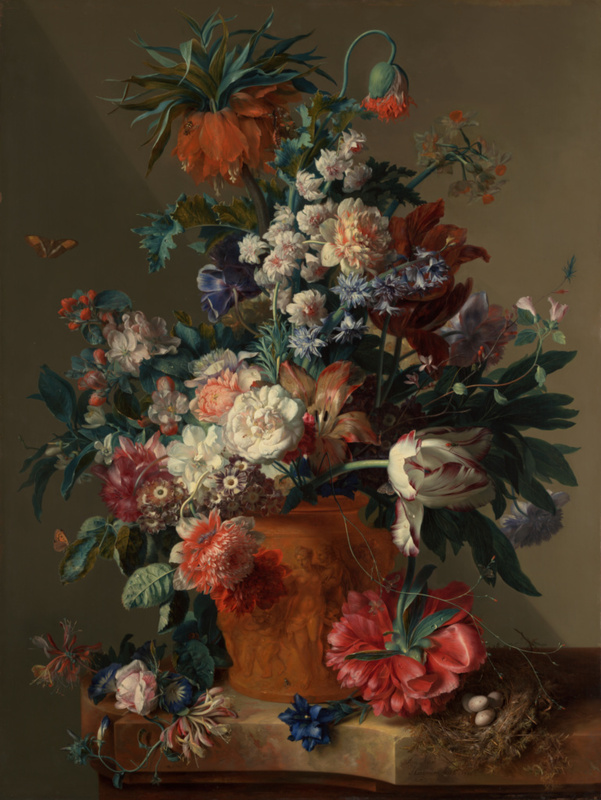 Arranged in a terracotta vase displaying an antique relief, Jan van Huysum included flowers from all seasons of the year--roses, anemones, hyacinths, tulips, and more--and painted them directly from life. The flowers' nearly overripe quality attests both to nature's bounty and its transience. The bouquet is ordered in a loose pyramidal shape, with flowers and greenery almost bursting to be free of the vase. Butterflies and other insects fly or crawl amongst the arrangement, and drops of water are visible on leafs and shiny petals. Van Huysum painstakingly applied layer upon layer of thin oil glazes to capture the brilliant colors and delicate textures of the blossoms. Because each flower could only be painted while in season, it sometimes took the artist several years to complete a single painting. Source: Priem 1997, p. 118. Pieter van Winter, 1745 - 1807 (Amsterdam, The Netherlands), by inheritance to his daughter, Anna Louisa Agatha van Loon-van Winter, 1807. The painting remained in his Amsterdam house, De Saxenburg, after his death. Anna Louisa Agatha van Loon-van Winter, 1793 - 1877 (Amsterdam, The Netherlands), upon her marriage, collection combined with that of her husband, Willem van Loon, 1815. Anna Louisa Agatha van Loon-van Winter, 1793 - 1877 and Willem van Loon, 1794 - 1847 (Amsterdam, The Netherlands), retained by Anna Louisa Agatha van Loon-van Winter upon his death, 1847. Anna Louisa Agatha van Loon-van Winter, 1793 - 1877 (Amsterdam, The Netherlands), by inheritance to her nine children, 1877. Heirs of Anna Louisa Agatha van Loon-van Winter, 1793 - 1877 (Amsterdam, The Netherlands), sold to a consortium of (Mayer) Alphonse de Rothschild, Gustave (Samuel James) Saloman de Rothschild, Edmond James de Rothschild, Ferdinand (James Anselm) de Rothschild, and Lionel (Nathan) de Rothschild, 1877. Baron (Mayer) Alphonse de Rothschild, French, 1827 - 1905 and Baron Gustave (Samuel James) Salomon de Rothschild, 1829 - 1911 (Paris, France) and Baron Edmond James de Rothschild, Austrian, 1845 - 1934 and Baron Ferdinand (James Anselm) de Rothschild, 1839 - 1898 and Baron Lionel (Nathan) de Rothschild, 1808 - 1879, distributed, possibly by lottery, to Lionel (Nathan) de Rothschild, 1877. Baron Lionel (Nathan) de Rothschild, 1808 - 1879, probably by gift to his son, Alfred (Charles) de Rothschild, by 1879. Alfred (Charles) de Rothschild, 1842 - 1918 (Halton, Hertfordshire, England), by inheritance to his nephew, Lionel (Nathan) de Rothschild, 1918. Lionel (Nathan) de Rothschild, 1882 - 1942 (Gunnersbury Park, Middlesex, England), by inheritance to his eldest son, Edmund (Leopold) de Rothschild, 1942. Edmund (Leopold) de Rothschild, English, 1916 - 2009 (Exbury House, Hampshire, England), sold through Patricia Wengraf Ltd., (London, England) to the J. Paul Getty Museum, 1982. Smith, John. A Catalogue Raisonné of the Works of the Most Eminent Dutch, Flemish, and French Painters [...]. 9 vols. (London: Smith and Son, 1829-42), vol. 6 (1835), p. 479, no. 69. Gower, Ronald. A Pocket Guide to the Public and Private Galleries of Holland and Belgium (London: S. Low, Marsten and Searle, 1875), p. 135. Davis, C. A Description of the Works of Art Forming the Collection of Alfred de Rothschild (London: Chiswick Press, 1884) vol. 1, unpaginated, no. 17, ill.
Hofstede de Groot, Cornelis. Beschreibendes und kritisches Verzeichnis der Werke der hervorragendsten holländischen Maler des XVII. Jahrhunderts. 10 vols. (Esslingen am Neckar: Paul Neff Verlag, 1907-28), vol. 10 (1928), p. 351, no. 62. Dutch Pictures 1450-1750: Winter Exhibition, 1952-53, exh. cat. 4th ed. [illustrated souvenir] (London: Royal Academy of Arts, 1952), p. 104, no. 568. Grant, M. H. Jan van Huysum 1682-1749, Including a Catalogue Raisonné of the Artist's Fruit and Flower Paintings (Leigh-on-Sea: F. Lewis, Ltd., 1954), pp. 18, 28, no. 22, fig. 6. Beal, Jack. "Sight and Sense: Studying Pictorial Composition." American Artist (February 1986), pp. 54-55, ill.
Sutton, Peter C. A Guide to Dutch Art in America (Grand Rapids: Wm. B. Eerdmans, 1986), p. 143, fig. 208. Reinewald, Chris. "Musea en Galeries in Amerika: Het Getty Museum; Een Romeinse villa aan de Pacific Coast." Tableau 9, no. 4 (February 1987), pp. 65, 67. Fredericksen, Burton B. Masterpieces of Painting in the J. Paul Getty Museum. Rev. ed. (Malibu: J. Paul Getty Museum, 1988), unpaginated, no. 29, ill.
Carr, Dawson W., and Mark Leonard. Looking at Paintings: A Guide to Technical Terms (Malibu: J. Paul Getty Museum, with British Museum Press, 1992), p. 33, ill.
Fredericksen, Burton B., et al. Masterpieces of Painting in the J. Paul Getty Museum. 3rd ed. (Malibu: J. Paul Getty Museum, 1995), unpaginated, no. 29, ill., entry by Burton B. Fredericksen. Jaffé, David. Summary Catalogue of European Paintings in the J. Paul Getty Museum (Los Angeles: J. Paul Getty Museum, 1997), p. 62, ill.
Fredericksen, Burton B., et al. Masterpieces of the J. Paul Getty Museum: Paintings (Los Angeles: J. Paul Getty Museum, 1997), pp. 70-71, no. 38, ill., entry by Burton B. Fredericksen. Priem, Ruud. "The 'most excellent collection' of Lucretia Johanna van Winter: the years 1809-22, with a catalogue of the works purchased." Simiolus 25, no. 2/3 (1997), pp. 118, 122, 220 (no. 81), fig. 26. Dik, Joris, and Arie Wallert. "Two Still Life Paintings by Jan van Huysum: An Examination of Painting Technique in Relation to Documentary and Technical Evidence." Leids kunsthistorisch jaarboek 11 (1998), pp. 391-414, fig. 1. The J. Paul Getty Museum Handbook of the Collections. 6th ed. (Los Angeles: J. Paul Getty Museum, 2001), p. 125, ill.
Allen, Denise, et al. Masterpieces of Painting in the J. Paul Getty Museum. Rev. ed. (Los Angeles: J. Paul Getty Museum, with Thames & Hudson, 2003), pp. 66-67, no. 35, ill., entry by Burton B. Fredericksen. Kammen, Michael. A Time to Every Purpose: The Four Seasons in American Culture (Chapel Hill: University of North Carolina Press, 2004), p. 101, plate, 6. Baca, Murtha. Cataloging Cultural Objects: A Guide to Describing Cultural Works and Their Images (Chicago: American Library Association, 2006), p. 35, ill.
Segal, Sam, Mariët Ellens, and Joris Dik, eds. The Temptations of Flora: Jan van Huysum, 1682-1749, exh. cat. (Delft: Het Prinsenhof, with Waanders, 2007), pp. 69, 71, 73, 74, 174-78, cat. F11 ill. The J. Paul Getty Museum Handbook of the Collections. 7th ed. (Los Angeles: J. Paul Getty Museum, 2007), p. 120, ill.
Helvey, Jennifer. Irises: Vincent van Gogh in the Garden (Los Angeles: J. Paul Getty Museum, 2009), pp. 57-58, fig. 31. Woollett, Anne T. Miraculous Bouquets: Flower and Fruit Paintings by Jan van Huysum (Los Angeles: J. Paul Getty Museum, 2011), unpaginated, ill.
Chansigaud, Valérie. Une histoire des fleurs: Entre nature et culture (Paris: Delachaux et Niestlé, 2014), p. 139, ill.
Padilla, Carmella, and Barbara Anderson, eds. A Red Like No Other, exh. cat. (New York: Skira Rizzoli, 2015), pp. 227, 230-31, fig. 25.10. Discuss how scientists and artists observe nature and explore symbolism of nature. Tied to Open Court unit City Wildlife.